TC622 and TC624 are programmable solid state temperature sensors designed to replace mechanical switches in sensing and control applications. Both devices integrate the temperature sensor with a voltage reference and all required detector circuitry. The desired temperature set point is set by the user with a single external resistor. Ambient temperature is sensed and compared to the programmed setpoint. The OUT and OUT outputs are driven to their active state when the measured temperature exceeds the programmed setpoint. 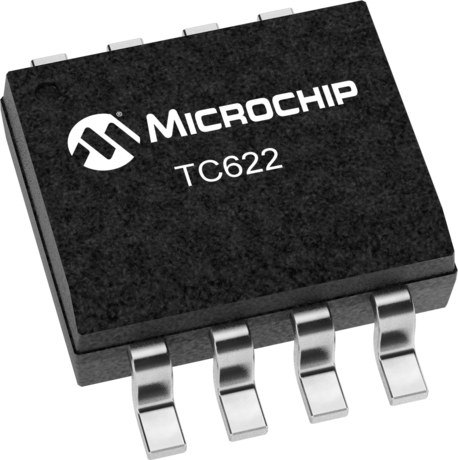 The TC622 has a power supply voltage range of 4.5V to 18.0V while the TC624 operates over a power supply range of 2.7V to 4.5V. Both devices are usable over a temperature range of – 40C to +125C (TC622Vxx, TC624Vxx). Both devices feature low supply current making them suitable for many portable applications. Eight-pin through-hole and surface mount packages are available. The TC622 is also offered in a 5-pin TO-220 package.